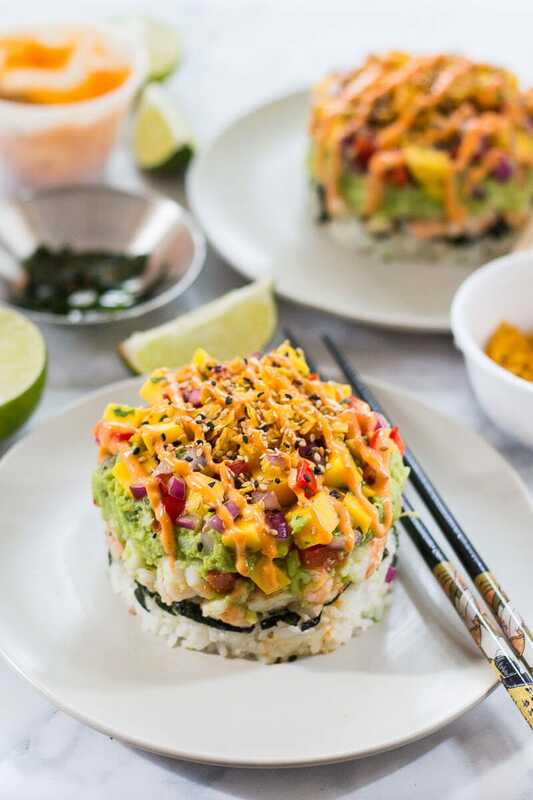 These Spicy Shrimp Stacks with Mango Salsa are a fun twist on a spicy California roll, topped with a quick guacamole and drizzled with spicy-sweet Bang Bang sauce! GUYS!!!! There's a new summer entree in town, and you DON'T have to go to one of your favourite restaurants to order it! 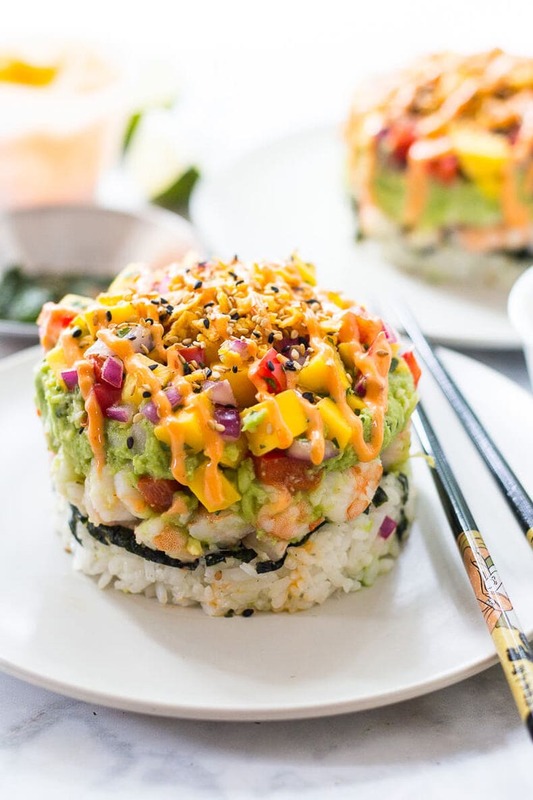 These Spicy Shrimp Stacks with Mango Salsa are guaranteed to become your next favourite summer dinner – they're a delicious no-cook option for those hot summer nights where the thought of cooking totally turns you off. 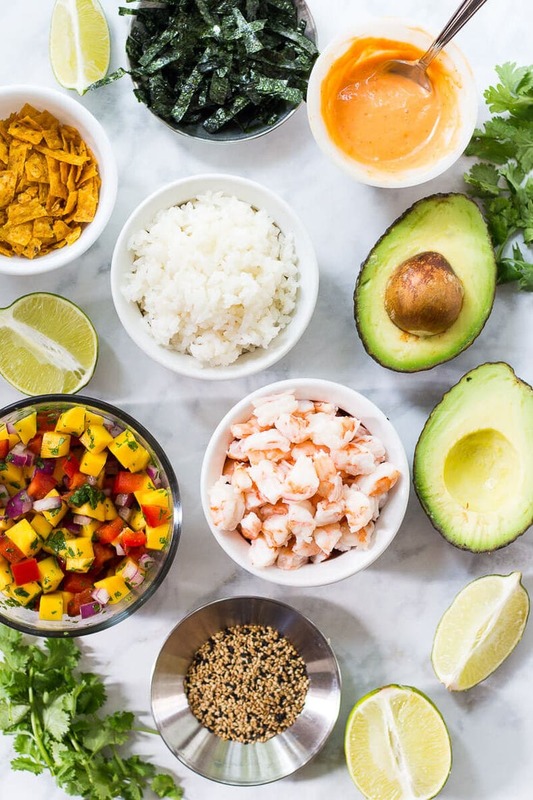 There's such a burst of vibrant flavours all over the place in this recipe, from the tangy mango salsa to the crunchy, salty tortilla strips and quick guacamole. I seriously just ate this thing for lunch and dinner the past couple days and looking at these pictures is making me crave it again already!!! Am I playing my love of cooking up a little too much though? 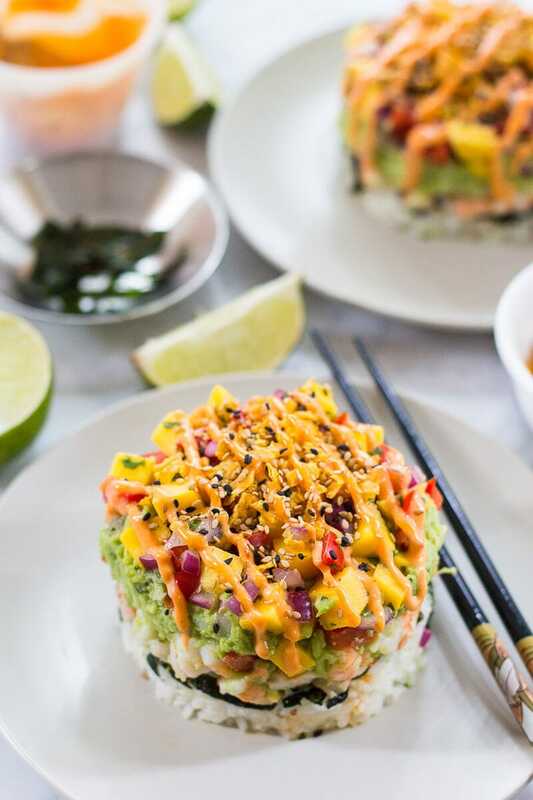 I was inspired to create these Shrimp Stacks from a seriously amazing ahi tuna poke stack I had at the newly opened Cactus Club Cafe in downtown Toronto for a friend's birthday a few weeks back. Let me tell you this place is fancyyyyyyy – and that includes the food! I had my heart set on re-creating the tuna version myself, but with fresh tuna steaks so hard to track down at the grocery store and so expensive, I decided that shrimp would do. And can you ever have shrimp without bang bang sauce? I was going to make a simple spicy mayo with some sriracha but remembered how big of a hit my Bang Bang Shrimp Tacos were with the family a few weeks ago. So shrimp stacks and bang bang sauce. Yep, we're doing thissssss. 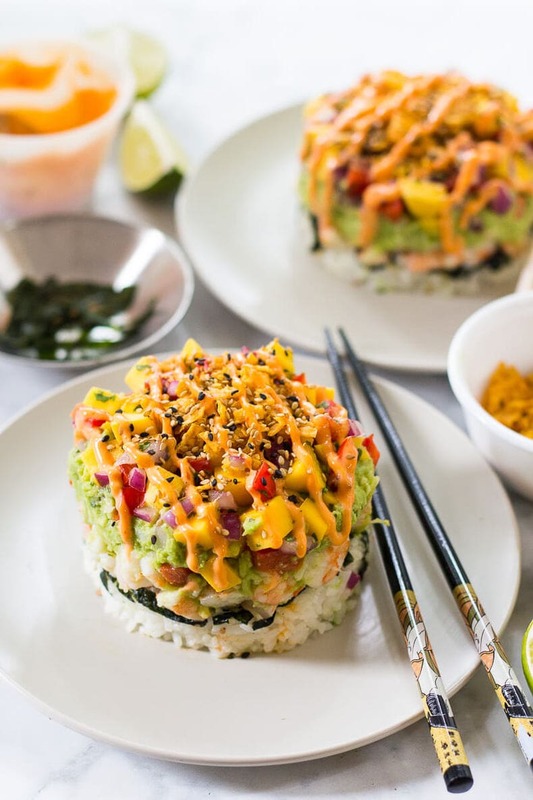 Looking to hop on the tuna poke trend? I created some tuna poke bowls a few months back with a non-traditional sesame-crusted sear on the outside of the fish. 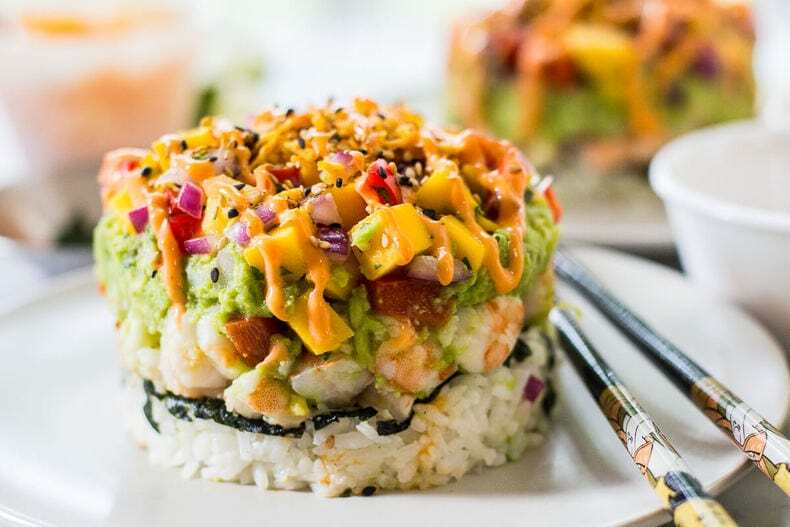 Super yummy and I highly recommend you use this recipe if you're going to re-create these shrimp stacks with tuna poke. Or if you're not a fan of mango salsa, you could switch it up with this kiwi salsa recipe I developed a couple weeks ago too. Either way, a summer fruit salsa to top everything off here is key! 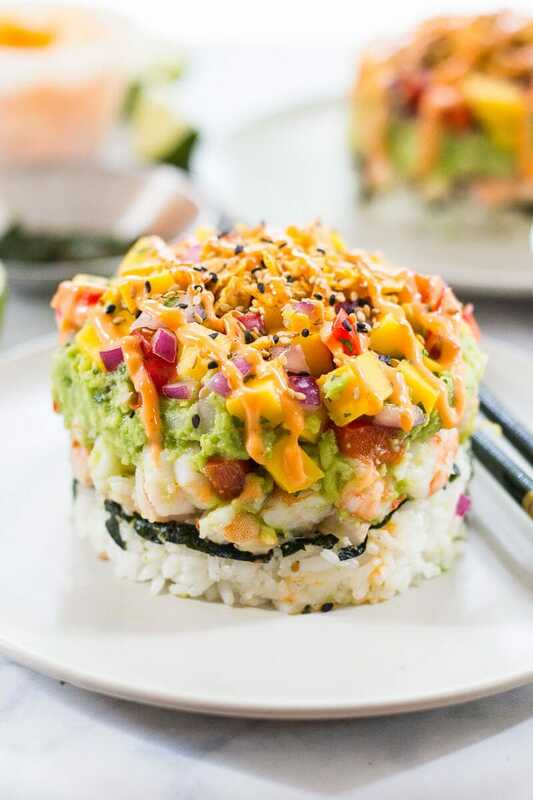 Will you be whipping these Spicy Shrimp Stacks with Mango Salsa? If you try any of my recipes be sure to let me know on Instagram, Twitter or Facebook – I’d love to hear from you! You can get sushi rice here. And a rice cooker makes meal prep so much easier! This is the one I use. I use the 1-cup measuring cup from this set – metal cups make it so much easier to dump all the ingredients out into a stack. In a rice cooker or in a small saucepan, cook sticky rice for the time accorded on package directions (usually 15-20 min). Meanwhile, mix together ingredients for guacamole (or just use mashed avocado) and mix together mango salsa, along with bang bang sauce. In a 1 or 2 cup measuring cup (I used a 2 cup measuring cup and it was the perfect size for dinner), spoon in mango salsa until a there is a thin layer, then spread half of the avocado mixture overtop. Layer with shrimp, then strips of nori, then sticky rice. Press down hard, then trace with a knife all the way around the measuring cup to loosen mixture. Dump onto a plate, careful to make sure mixture remains in tact. Top mango salsa with crumbled wonton or tortilla strips, then drizzle bang bang sauce overtop using a plastic bag with a tiny hole cut out in a corner. Sprinkle with sesame seeds and serve with fresh limes and soy sauce. What a beautiful feast for the eyes, such a vibrant plate, love it. The presentation of this dish is amazing – and the flavours sound wonderful too. Can I admit I’ve never had bang bang sauce though? Guess I need to try it soon! Chelsea you need to try bang bang sauce!!! 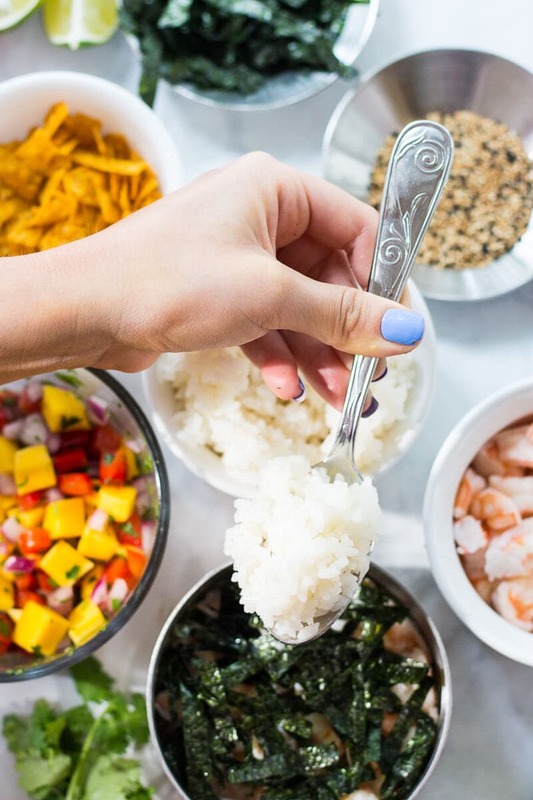 I have to admit it’s not the healthiest, but served in small doses it’s okay 😉 And it’s pretty easy to whip up too – one of my go-to condiments! I could eat this every day. So yummy! Do you serve this cold ? Hi Jill! Yes, I serve this cold – just like you would sushi! It would be really tasty though too if you warmed up the shrimp and rice! I made this for a dinner party last August. I liked it so much I’m making it again for New Year’s Eve! I made this tonight, and it was fantastic!! I used some jalapeño in the mango salsa and guacamole made chunky… it was wonderful!! A must try and enjoy!! Thank you for sharing the recipe! I’m so happy to hear that Tanya!!! This one’s of my faves 🙂 Thanks for sharing with me! What kind of measuring cup do you use? I’m making them as appetizers – I have both a Pyrex glass with a handle, & a plastic scoop-like 1 cup. I’m making this for a dinner party of foodies, and want it to look as good as yours …. so excited! Made it tonight! Was amazing! Do you have nutritional info for this? It looks fantastic! Hi Catherine – I don’t have any nutritional info on my older recipes unfortunately! 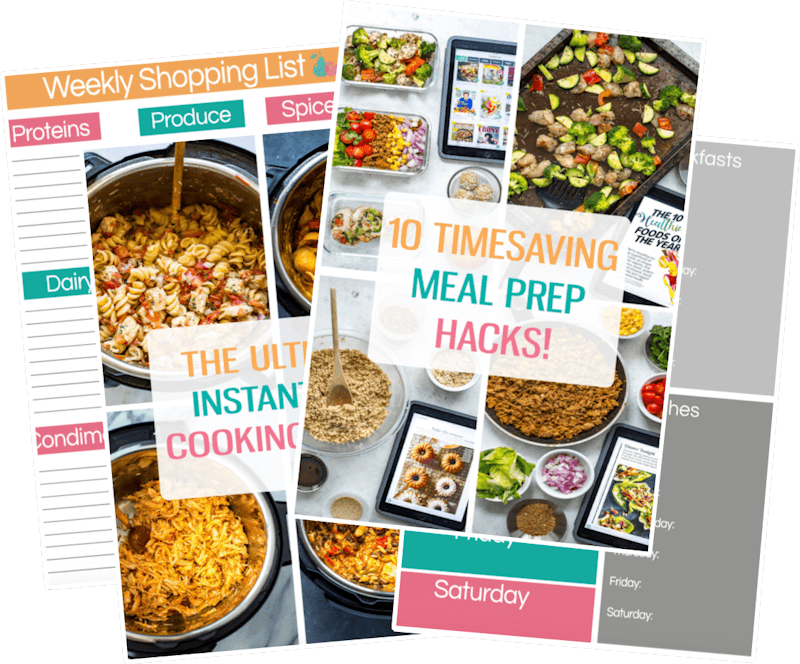 I started providing nutritional info mid-2017 so any recipes older than that won’t have it because I just don’t have time to go through and update them all (I think there’s over 200 recipes that would need updating and I had to give up at some point LOL). You can always look up the info on an app like MyFitnessPal or Livestrong – something like this shouldn’t be more than 400 calories a serving. Hope that helps! I have a Pinterest board titled “Knock Their Socks Off!”. This is a perfect addition! 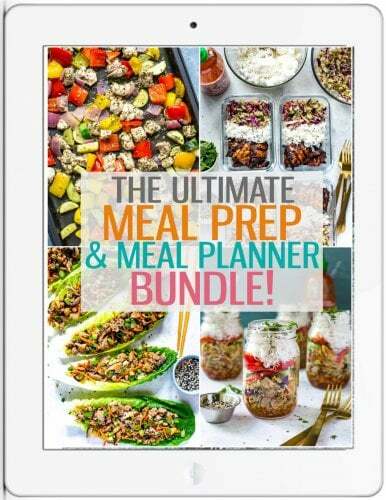 Can you make the rice a couple hours ahead and then create the stacks when you are ready? I was hoping to take this to someone’s house but need to have some of the things done ahead of time. Yes you can definitely do this Tracey! I find the leftover rice is actually much easier to work with! I used raw tuna instead of prawns and it worked perfectly!